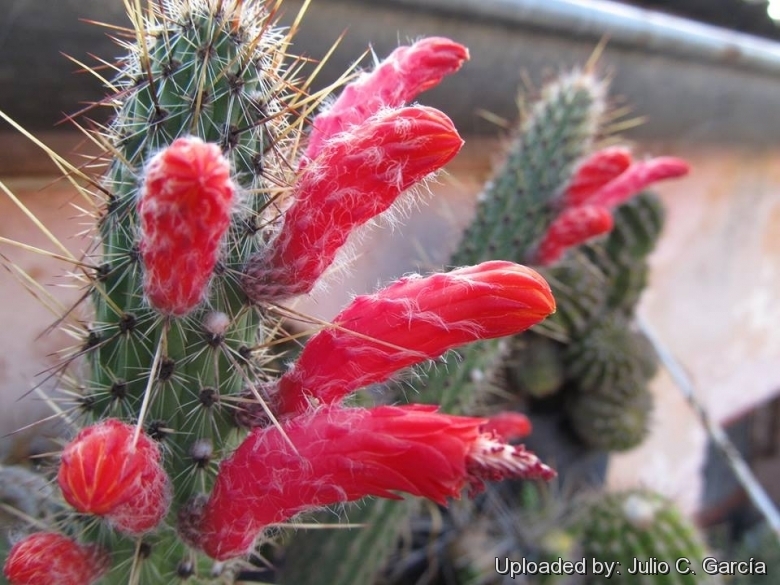 Origin and Habitat: Cleistocactus baumannii is widely distributed in the Chaco of Bolivia, western Argentina, Uruguay and Paraguay. Altitude range: It occurs at elevations between 10 and 1,000 metres above sea level. 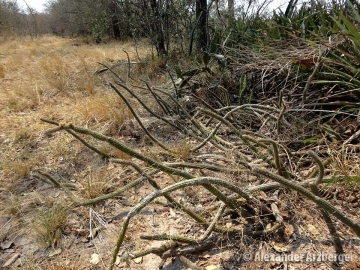 Habitat and Ecology: This cactus grows in sandy and clayey soils, in forest borders as well as within dense or open forests. 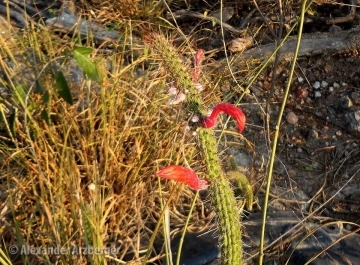 It can also be found in the scrubs of the dry Chaco and in the eastern region of Paraguay. Furthermore, it grows in rocky areas and open sites. This species is locally abundant and favored by anthropogenic activities, and there are no major threats affecting it. It also occurs in many protected areas. 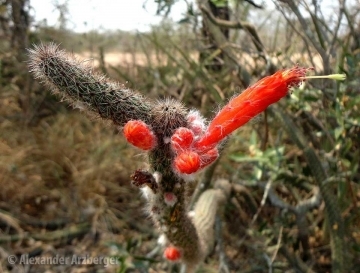 The Chacoan peccary (Catagonus wagneri) eats this cactus mostly in the dry season. Description: Cleistocactus baumannii is a columnar cactus with several thin ribbed stems branching at base, covered with whitish spines, sometimes yellow or brown. Flowers are tubular and orange-scarlet, slightly open showing only the style and stamens. Six subspecies are recognized, the nominate, subsp. horstii (P.J.Braun) N.P.Taylor, subsp. anguinus (Gurke) P.J.Braun&Esteves, subsp. croceiflorus (F. Ritter) P. J. Braun & Esteves, subsp. chacoanus (F. Ritter) P. J. Braun & Esteves and subsp. sanctacruzensis (Backeb.) Mottram. Stems: Somewhat branching at base, fairly stiff, erect or arching, 2 meters high or more, 2.5 to 3.5 cm. in diameter, dark green. Ribs: 12 to 16, low. Areoles: Approximate, brown or black-felted. Central spine: One, yellowish or dark brown, 4 cm or less long. Radial spines: Needle-like, 8 to 20, white, yellow, or brown to 1.8 cm long. Flowers: Born along the stem over several months in summer, yellow-orange to scarlet, 5 to 7 cm long, narrow, 1 cm in diameter, sharply upcurved, and then narrowly S-shaped beyond the pericarpel, with oblique corolla; scales on ovary and flower-tube ovate, acute; perianth-segments short and broad, acute. Stamens red numerous, appressed against the upper part of the flower-tube. Stamens and style exserted. Fruit: Spherical, 1 to 1.5 cm in diameter, pink to red with white pulp, edible. Cleistocactus baumannii (Lem.) Lem. : (subsp. baumannii) has 15-20 radial spines and red flowers. Distribution:Northeastern Argentina, Paraguay, and Uruguay. Cleistocactus baumannii subs. anguinus (Gürke) P.J.Braun & Esteves: decumbent with 10-11 radial spines and yellow-orange or orange-red flowers. Distribution: Paraguay. Cleistocactus baumannii subs. chacoanus (F.Ritter) P.J.Braun & Esteves: has more erect shoots, with less ribs, 12-15 radial spines and shorter bilaterally symmetrical flowers, usually red. Distribution: Gran Chaco region of Bolivia. Cleistocactus baumannii subs. croceiflorus (F.Ritter) P.J.Braun & Esteves: has 8-12 radial spines and yellow flowers. Distribution: Puerto Casado, Alto Paraguay department, Paraguay. Cleistocactus baumannii subs. horstii (P.J.Braun) N.P.Taylor: has 11-15 radial spines and bilaterally symmetrical flowers, orange-red. Distribution: Mato Grosso do Sul, Brazil. Cleistocactus baumannii var. paraguariensis (F.Ritter) P.J.Braun & Esteves: 12-15, yellow to reddish yellow with darker tips, and 4-5, reddish brown centrals. Distribution: Paraguari department, Paraguay. Cleistocactus baumannii subs. santacruzensis (Backeb.) Mottram: has fewer but more elevated ribs, only about 10 radial spines and red flowers (perhaps the same as subsp. anguinus), Anthers barely protruding. Distribution: Santa Cruz, Bolivia. Cleistocactus bruneispinus Backeb. : has brown spines. Distribution Cochabamba, Bolivia. Cleistocactus margaritanus f. cristatus hort. : crested form. 9) Serrano, M. & J. Terán. “Identific. Esp. Veg. Chuquisaca” 1–129. PLAFOR, Intercooperación, Fundación Ceibo, Sucre. 1998 . 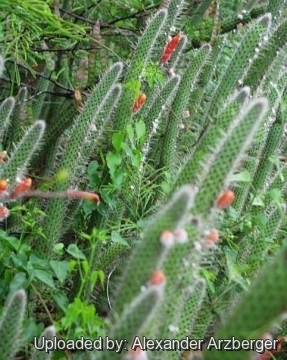 Cultivation and Propagation: Cleistocactus baumannii is a a much decorative hardy cactus. It is very easy to grow but tends to look untidy in the collection if not staked. It is recommended as one of the best of the sprawling Cleistocactus forms, with the added benefit of being reliably hardy. Growth rate: Cleistocactus baumannii grows rapidly enough to need pruning. Water: It needs plenty of water in the summer (during the vegetative period) when it will flower for months, but allowing the substratum to completely dry up before irrigating again; in winter, it’s to be kept dry. Preferable not to water on overcast days, humid days or cold winter days. Maintenance: Repot in the spring, when their roots become cramped. Generally, they should be repotted every other year in order to provide fresh soil. After repotting, do not water for a week or more. As with many cleistocacti, the flowers are produced in profusion: the dead ones just fall off so need to be regularly tidied up. It will probably benefit from the occasional pruning to keep it in check and provide cuttings for propagation. Otdoors clumps need renewal after five to ten years, done by removing old growth.